Hello and Happy Hump Day! I think after only working 2 days last week that this week will never seem to end! Oh well, work during the day and craft at night... that's the way I roll! It's Wednesday so that means another Paper Craft Crew Challenge! What do you think of this sketch?? I took one look at this and immediately saw Christmas Ornaments! Of course you know I still have Christmas Cards to make so you knew it would be something to do with Christmas! 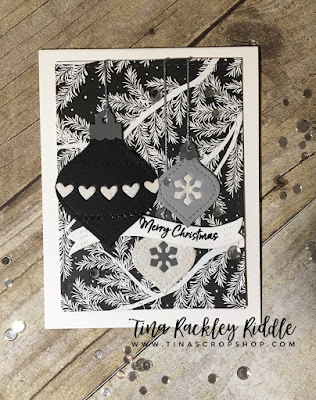 I love this Black and White Christmas Pine Patterned Paper from FSJ so that's where I got my inspiration! I decided that I wanted to make my ornaments black, white and shades of gray or silver. 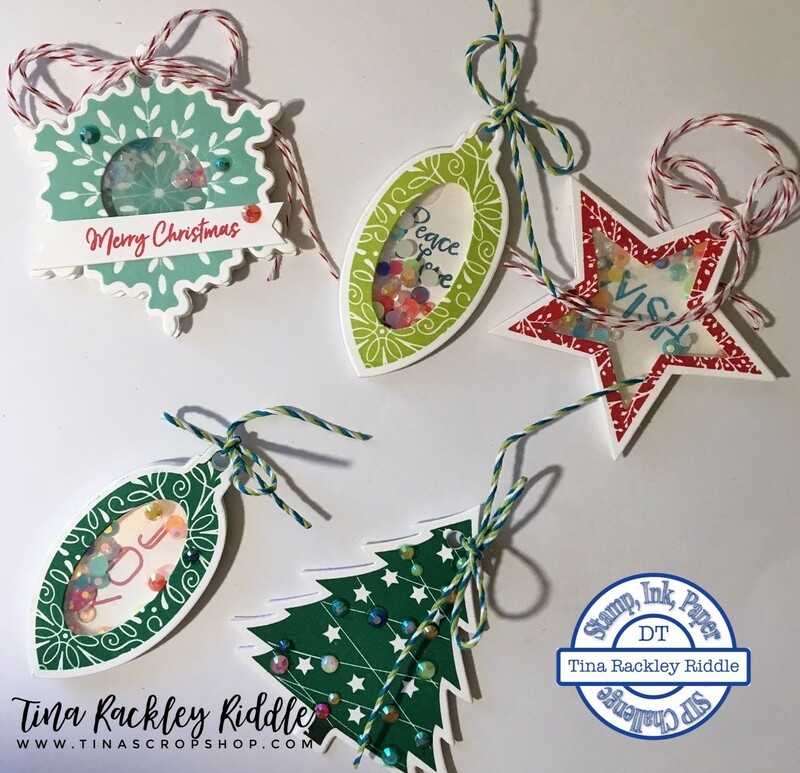 These Lawn Fawn Stitched Ornaments Dies were perfect to make use of all of my colors. I absolutely love how it turned out! It looks even more beautiful in person! Hello and Happy Tuesday! I hope you had a wonderful and hopefully long Thanksgiving Weekend! I had a wonderful and super long holiday and I am so thankful we were able to spend it with most of our children and grandchildren. We are truly blessed! 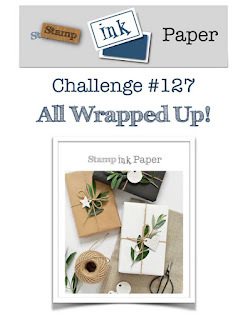 This week's challenge at Stamp, Ink, Paper is All Wrapped Up and is all about packaging or tags. 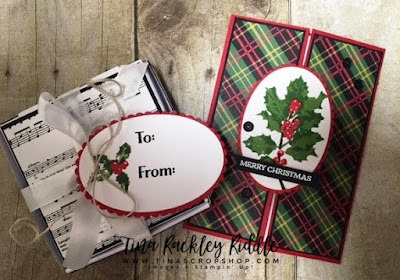 For me this was a really cool challenge because I had recently received my November My Monthly Hero Kit from Hero Arts that had lots of tag stamps and dies along with a ton of sentiments! I adore these little tags. They are so cute, they could be ornaments! I made most of them into shakers as the dies in the kit had shapes that were perfect to cut out the inside. For the tree, I used some Lucy's Things "Little Things Rainbow Jewels" that I thought worked perfectly for the ornaments. The kit was wrapped up with some twine that I used for some of the tags.. for the others I used some Red and White twine from my stash. 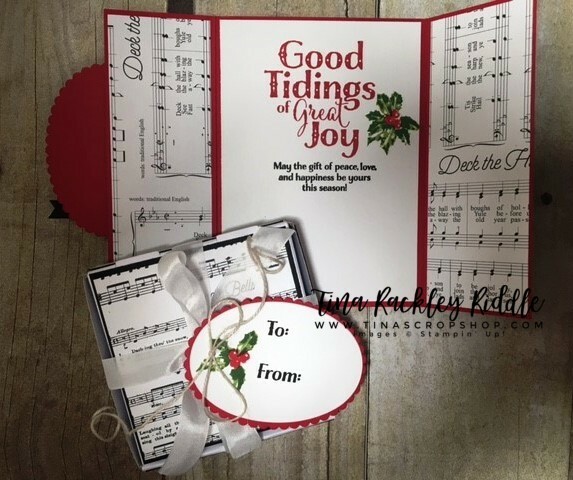 I kept the back simple in that I stamped the exact image as the front but added the To and From Shape to the back so that I can write the names on it. I have lots more of these to make but I love how these first few turned out! I hope you love them too! Hello and Happy Thanksgiving Eve. Tomorrow is the day.. I hope you have the Turkey bought! We aren't having Turkey this year. Honestly I didn't really intend to cook. The last couple of years we have gone to Cracker Barrel with the kids that were in town on Wednesday night to have our Thanksgiving. Everyone just has so many places to go that it seemed silly to spend so much time cooking a huge meal for the kids to spend 1 or 2 hours and leave to eat someplace else. Well this year I decided I wanted to try cooking again but this time I will cook on Wednesday instead of Thursday and I'm not making a thousand dishes this time. So I've bought a ham, and will be making homemade macaroni and cheese, sweet potato casserole, corn casserole and green bean casserole. Those are usually the most requested dishes by the kids! Hopefully keeping the menu a little more simple and having it on Wednesday will be a great combination and will work out well! Well since it is Wednesday, that means another Paper Craft Crew Challenge. This one was super easy and a lot of fun. It's a Very Vintage Theme and that's one of my favorite styles! I used the Stampendous Snowy Postcard Stamp on this one.. it is perfect for a Vintage Look! I started off by Stamping the Snowy Postcard Stamp onto Crumb Cake Cardstock with Early Espresso Ink. 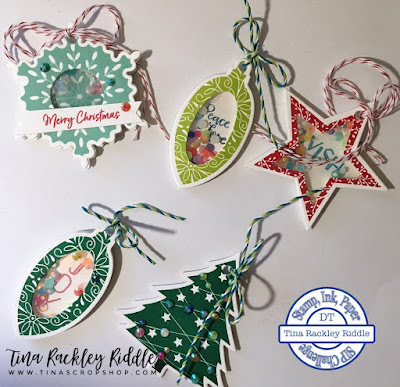 Once I stamped it, I used an Aqua Painter and some Old Olive Ink to color in the Houses and Holly Leaves as well as the oval ring around the scene. I sprayed the edges with water and used my finger nails to distress the edges. I used a heat tool to dry it and then used the aqua painter to color the edges with more of the Old Olive Ink. I then sponged some Crumb Cake Ink onto the front to age it. I stamped the retired French Script Stamp in Mossy Meadow Ink (also retired) onto Old Olive Cardstock. I distressed the edges of this layer the same way I distressed the edges of the top layer. 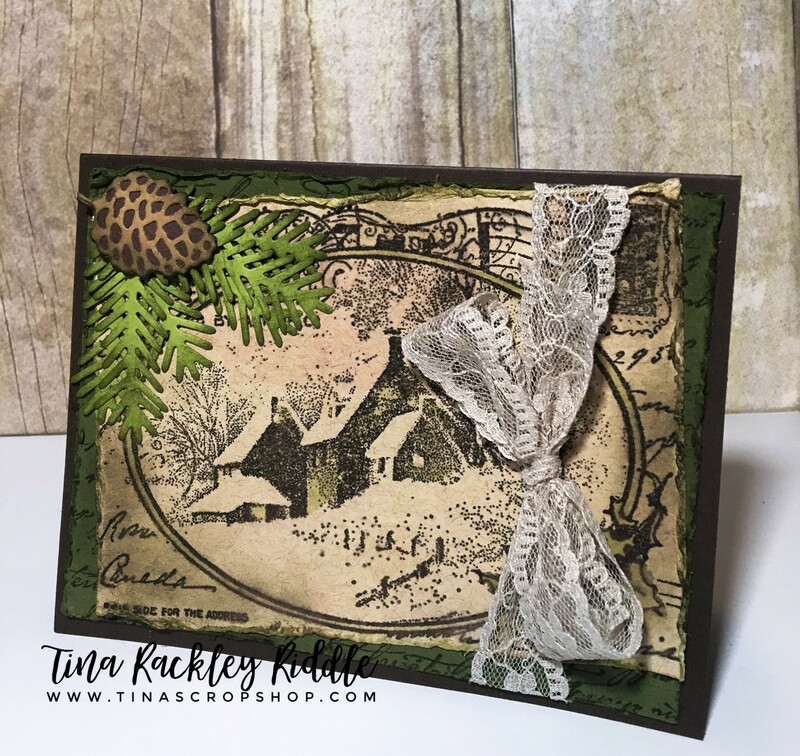 I used craft glue to adhere slightly skewed the Snowy Scene onto the Old Olive layer. I tied a piece of Tan Lace around the two layers and then adhered them both to an Early Espresso A2 Card Base. After deciding that the left upper corner needed some love, I cut some Pine Boughs out of Wild Wasabi Cardstock using the Take A Bough Die set from Concord and 9th. I sponged the edges with Old Olive Ink and then adhered them with Ranger Multi Medium Matt. 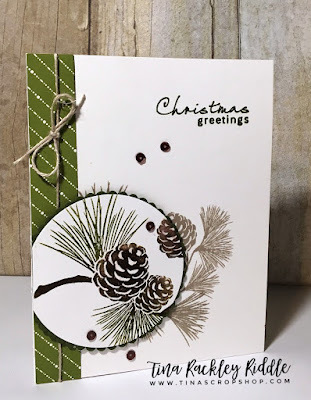 I used a Gina Marie Pine Cone Die set to cut out the small pine cone. The bottom layer was Chocolate Chip Cardstock and the upper layer was Soft Suede. I sponged some Soft Suede Ink over the top of the Pine Cone and adhered it over the Pine Boughs with Glue Dots. I know that had a lot going on.. thanks for hanging in with me on it! Thanks for stopping by and have a Blessed Thanksgiving! Hello and Happy Tuesday! I hope you're ready for Thanksgiving because it's just 2 days away! 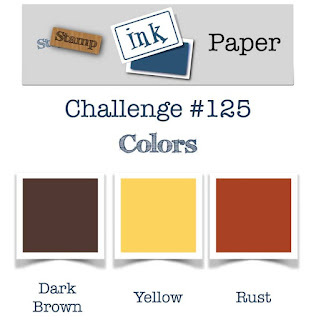 This week's Challenge over at Stamp, Ink, Paper is all about Thankful, Grateful, and Blessed. I decided since I was finished with my Thanksgiving Cards that I would make a Thank You. After all when you are Thankful for someone or something, you often say Thank you, right?? Finally I used the My Monthly Hero Kit from July 2017. I had previously only used one image and wasn't exactly sure how much I liked it. Well ..... I LOVE it! Some of the cutest images! I just adore this little pitcher and the bouquet of flowers is just perfect in it. I honestly had part of this card already made. I have a drawer that I keep half made cards in. Am I the only one that starts a card and then gets on a completely different track and ends up with partially made cards? Well I do it a lot. For this one I had the Early Espresso Base done with a layer of Old Olive embossed with the Layered Leaves Dynamic Textured Embossing Folder. I also had the strip of the Early Espresso Chevron DSP matted in Early Espresso Cardstock on the partially done card. So what I did was add some of the light pink DSP matted on a scrap of Early Espresso. I used my bone folder to pry open a section of the already adhered strip so I had room to tuck the new strip under the old one. Once through, I adhered the right side down first. I then added some Natural thread on the left side three times around and then tied it into a bow. I used some Multi Medium Matt to adhere the bow down and then used some craft glue to adhere the left side of the new strip down. 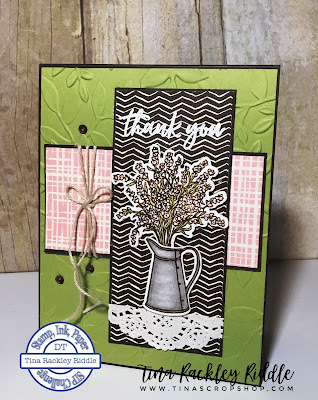 I heat embossed my Thank You sentiment in White on the top of the Chevron Strip. Both the flowers and the pot were first inked with Versamark and then with Soft Suede Ink onto Neenah Classic Solar White Cardstock. I then clear embossed them. 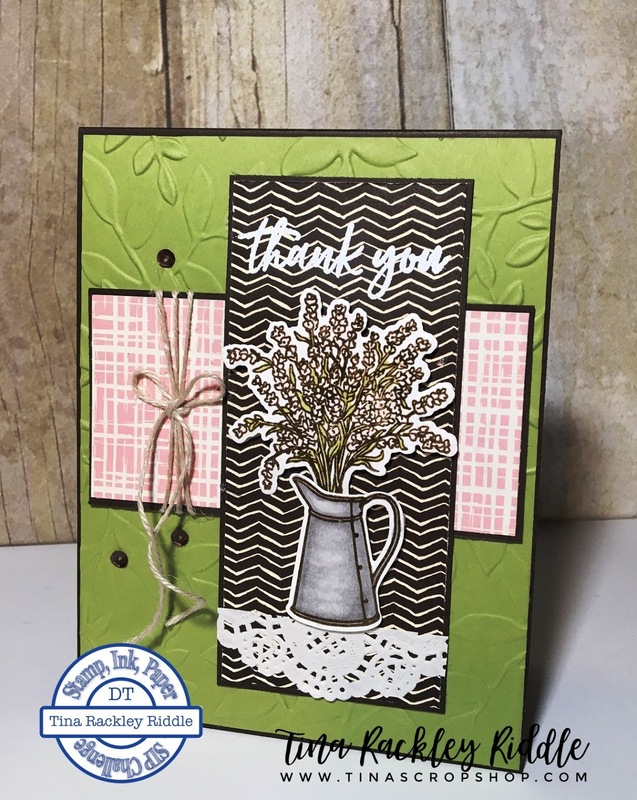 I used my Stampin' Blends to color both the flowers, leaves and the planter and then used the coordinating dies to cut them out. I adhered them all with 3M Foam Tape. Finally I decided that the planter needed grounding so I cut a small section of a White Doily and adhered it with Multi Medium Matt. I finished it off with 3 Espresso Pretty Pink Posh Sequins! Hello and Happy Tuesday! Hope you are having a fabulous Fall weather week. Today is of course another Stamp, Ink, Paper Challenge and is my very last Fall Card of the year! Take a look at the Challenge Graphic.. it really does scream fall to me! 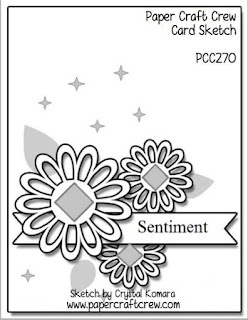 sentiment is from the retired Lighthearted Leaves stamp set. 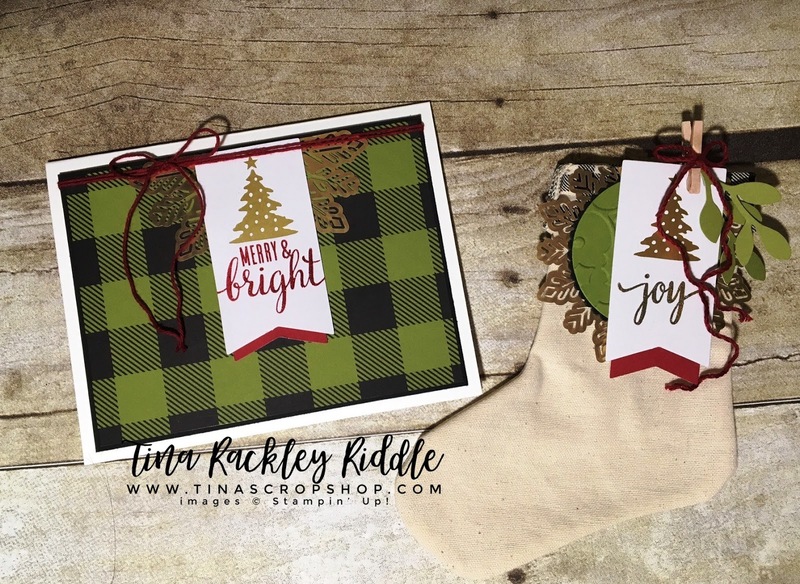 I love this sentiment and can't seem to part with this set! 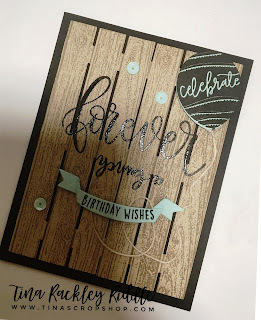 All of my stamping was done on one layer of Watercolor Paper. I used the smooshing technique to smoosh some Pumpkin Pie, and Daffodil Delight Ink onto the watercolor paper and dried in between layers with my heat tool. 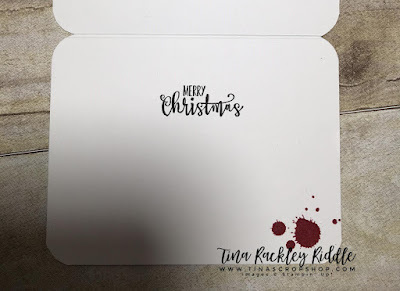 Once completely dry I ran my embossing buddy over the front of the card. I used my Misti to stamp the leaves and Sentiment first in Versamark and then in Early Espresso. 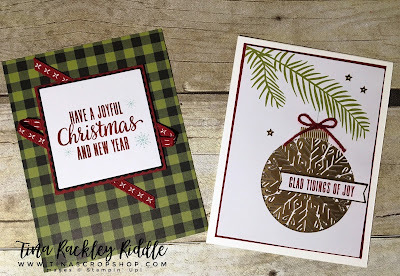 I then heat embossed all of the stamping with clear embossing powder. 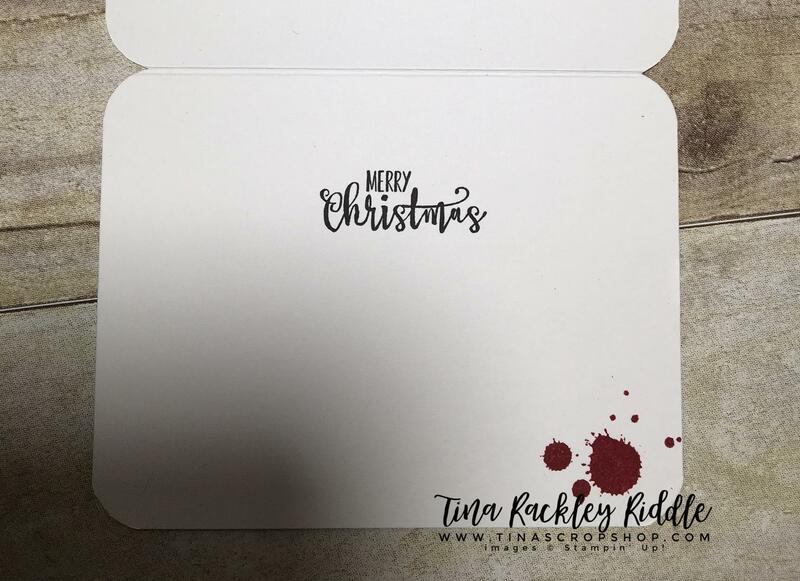 There ending up being just alittle more white on the stamped panel than I wanted so I took a sponge and a little bit of Daffodil Delight Ink to fill in the other areas. I used my Lil' Inker Stitched Rectangle Dies to cut out the stamped panel and layered on a skinny layer of Early Espresso Cardstock. All of that was mounted to a A2 card base of 110# Neenah Classic Crest Solar White Cardstock. Lastly I added a few sequins from Pretty Pink Posh to finish it off. Hello and Happy Tuesday! I hope your week is off to an awesome start! 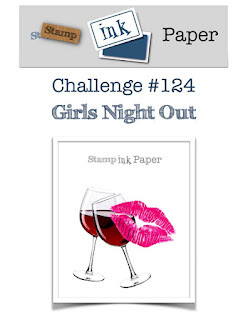 Since it is Tuesday that means another Stamp, Ink, Paper challenge and this time it's all about Girls Night Out! 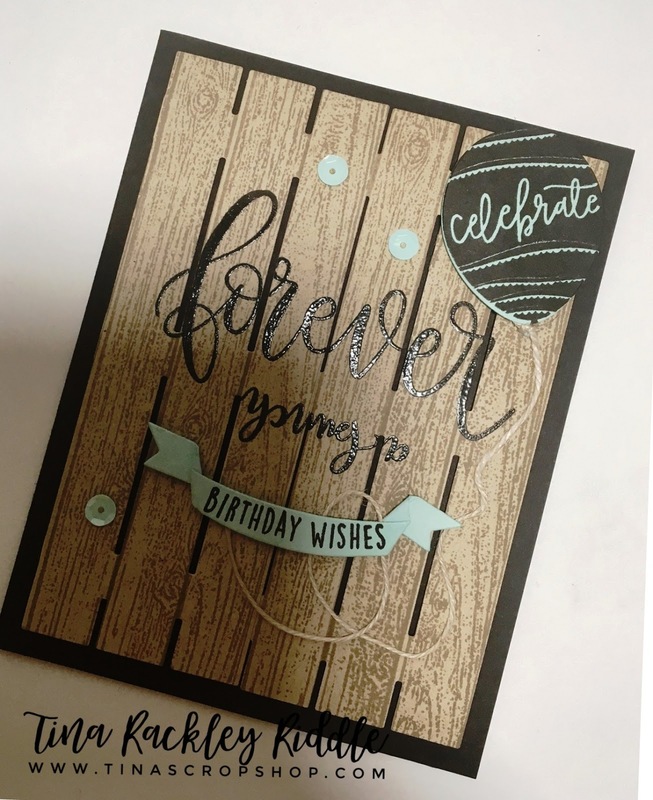 I finally got the opportunity to use my Stampin' Up! Half Full Stamp Set. I have a few friends that are all about wine so I why not start on Christmas Cards for our card swap! This one was pretty simple with just a little bit of coloring. 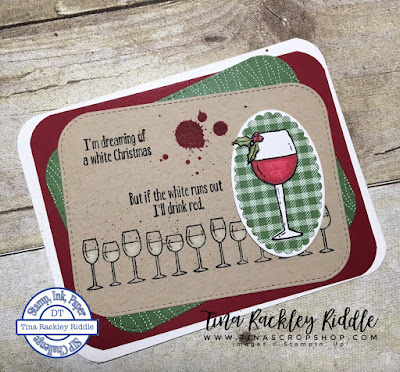 I stamped the glasses onto Kraft Cardstock with using my Misti and the Creative Corners to align the wine glasses. I used two light colored pencils to color in the white wine. 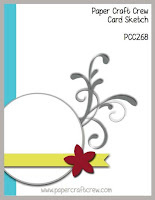 The larger wine glass was stamped with Memento Tuxedo Black Ink onto Neenah Classic Crest Solar White 80# cardstock. I used the Stampin' Blends Markers in Cherry Cobbler to color in the wine and the berries and in Old Olive for the holly leaves. Both the large wine glass and the berries were fussy cut. 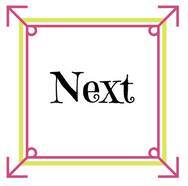 I used my Stampin' Write Basic Black marker along the edge of the fussy cutting so that the white would not show. The DSP used is from the Stampin' Up! Quilted Christmas 6x6" paper stack.... I love these prints! The larger splats are of course from Gorgeous Grunge (Retired). 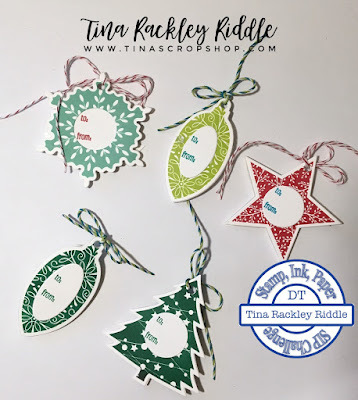 The smaller splats are from my Cherry Cobbler Stampin' Write Marker. I remove the top and pull the brush edge against the edge of the top to make the splatters.